Realme 1 comes with plastic like body with Diamond finish on Rear compared to a Metal body on Zenfone Max pro M1. 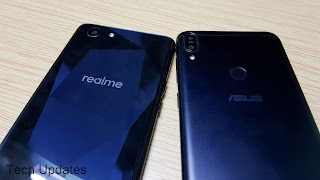 Both phones come with FHD+ Display Asus has brighter display compared to Realme 1. 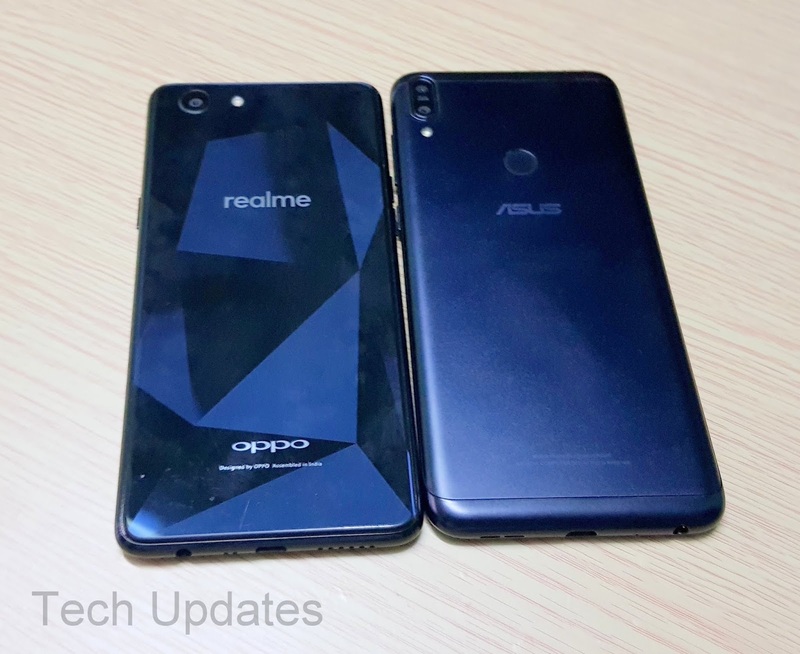 Realme 1 is powered by Octa Core MediaTek Helio P60 (MT6771) 12nm processor compared to 1.8GHz Octa-Core Snapdragon 636 processor on Zenfone Max pro in terms of day to day life performance both are fast and there was no lag. On Camera Realme 1 has 13MP rear camera with LED flash, a f/2.2 aperture and 8MP front-facing camera whereas Zenfone Max pro M1 has a 13MP rear camera with LED Flash, PDAF, 1.12μm pixel size, secondary 5MP camera and 8MP front-facing camera front camera is better on Realme whereas Rear better on Zenfone Max pro M1. Both phones have support for Dedicated MicroSD slot, Dual 4G VoLTE, face unlock and runs on Android Oreo. Realme 1 lacks fingerprint Scanner. Realme 1 has 3410mAh battery compared to 5000mAh battery on Zenfone max Pro m1 which can easily last for 1 and half day on heavy use. Realme 1 comes in Diamond Black and Solar Red color priced at Rs 8990 for 3GB RAM, Rs 10,990 for 4GB RAM and 13,990 for 6GB RAM. ASUS Zenfone Max Pro M1 comes in Black and Grey colors priced at Rs. 10,999 for the 3GB RAM version and the 4GB RAM costs Rs. 12,999. Zenfone Max Pro M1 offers Stock Android OS, 5000mAh Battery, Fingerprint Scanner which lacks on Realme 1 but has a better front-facing camera.